Weather in China can encompass a wide range of temperatures and conditions throughout the year in such vast land. Summers for example, could be very hot and humid in the South and East regions, and winters in the North are bitter cold. And remember, there is no such thing as "bad weather" only the wrong clothing, so bring the proper gear for the time of your travel and have a great vacation! Beijing Weather is hot and humid in the Summer, cold and dry in the Winter and average rainfall averages 23 inches / 60 cm per year mainly in the summer months. The best time to visit Beijing is probably in the Autumn when temperatures are pleasant in the 60's and 70's and Great Wall is not bursting at the seams with people! Spring temperatures are good as well, but it can be windy and dusty due to the northeasterly winds from Mongolia. You will notice many people wearing face masks. Here are some tips for dealing with pollution in China which might also help with the "dustiness" of this season. Summers are hot and humid, so pack plenty of t-shirts and light pants/shorts and you will be fine. An umbrella and some rain gear might also come in handy. If you can, book a hotel with a pool, kids will really enjoy that after a sweaty day of climbing the Great Wall or cruising around the Hutongs! Winters, although cold, can be very magical. Imagine having the Great Wall covered with snow and all to yourself. Hotel prices also are the best at this time. The Weather in Shanghai is milder and wetter because of its location at the estuary of the Yangtze River at the East China Sea. Spring is very pleasant and perhaps the best season to vist Shanghai. Temperatures are comfortable and flowers are in bloom. A very pleasant time for all sorts of outside activities. Summers are hot and rainy, temperatures in July and August could reach in the 90ºs - 100ºs F, 32º-40º C, although the official registered temperatures hang around 38ºc as factories must close by law when temperatures reach 40ºc! Humidity is highest on these months and averages in the 80% range. Autumn is comfortable and cool; however, the typhoon and rainstorm season can extend into September and rain could last until November. In Winter, although it can be very cold with night temperatures often dropping below zero (32ºF), it seldom snows. 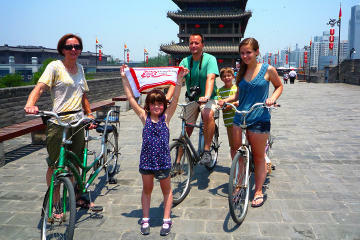 There are no extreme weather patterns in Xian and temperatures are pleasant year round. Rainfall is more frequent in Summer which help offset the warmer temperatures during this season with the quick showers that come and go in a flash. Our favorite season to visit is in the Springtime, in April and May. Temperatures are quite pleasant as it starts warming up, and the cherry trees are in bloom. Autumn offers cool temperatures and is also an ideal time to travel to Xian. Winter might bring a little snow, but it usually doesn't stay long. Days are overcast and foggy, but on the positive side, rates for hotels are the lowest at this time! A sub-tropical monsoon climate is typical of the Guilin-Yangshuo area which can be visited year-round. As temperatures might get a bit chillier in the winter months, travel to Guilin and Yangshuo is more popular from April to October when temperatures are quite pleasant. May and June are very wet, but rainy days can also be quite nice as the mist engulfs the mountains and makes for some very spectacular scenery.